Linda Marie Plume Agate is so named because this is the name of claim on which the stone is found. 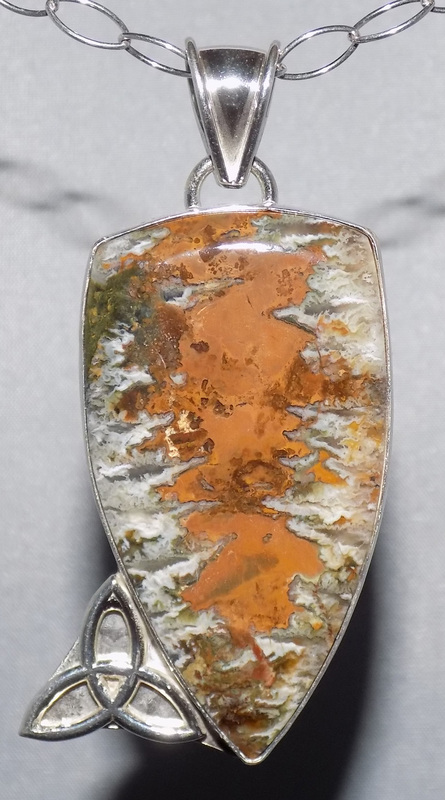 The combination of colors in the stone are incredibly striking. The left and right sides of this stone seems to mirror each other. The pendant is embellished with a Trinity knot in the lower left. $176.00 including free shipping within the US. This Linda Marie Plume Agate and Sterling Silver pendant is approximately 2 1/2 ″ tall, including bail, and 1 3/8″ wide. The necklace includes an 18″ Sterling Silver Chain.